Christa Ann Banister lives in St. Paul, Minnesota, with her husband, Will. They love to play Scrabble and throw darts on a map, dreaming about exotic travel locations. 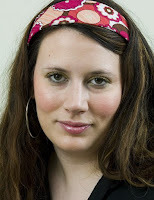 In addition to writing fiction, Christa is happily employed as a freelance writer for her many, many clients. People tell me I’m a modern-day Emma. Of course, I’ve never worn a corset (thank goodness) or particularly cared for taking tea with those cute little cucumber sandwiches. I’m actually more like the Emma that Alicia Silverstone played in Clueless: a relatively well-dressed, modern girl with a sunny disposition and a weakness for wanting to help make people happy — especially in love. Now that I am happily hitched, I take it as my solemn duty to make sure all my girlfriends are paired up too. After all, when I was hopelessly single, there were times when I could’ve used a major relationship intervention. So that’s where I come in. I’m like eHarmony without the pesky questionnaire and quarterly payments. Or that persistent aunt who’s always trying to fix you up with, oh, her tennis instructor. And unlike either of the aforementioned, I offer the personal insight of a trusted friend. On the surface, Jane is one of those enviable women who seems to have everything going for her. She has flawless skin that glows without a single drop of Clinique, and her silky blonde hair is cut in an effortlessly chic, Victoria Beckham (aka Posh Spice) bob. Her workout clothes are even impeccably selected, black-and-white Juicy Couture sweats with robin’s egg blue accents that bring out the unusual color of her eyes. Despite her exquisite taste in, well, just about everything, Jane hasn’t been as lucky in love. And with my past experience of having gone on every bad date imaginable before meeting Gavin — unfortunate stories to which Jane could relate all too well — I desperately wanted to help. So after her initial uneasiness about yet another blind date, I set her up with Weston, the lone single guy in my hubby’s touring band. the clear. Or so we thought. “What? He wanted to show you his feet?” I asked, feeling slightly nauseated. Feet aren’t exactly my favorite body feature — especially guys’ feet, which tend to be far more unkempt. In my opinion, a good pedicure could benefit anyone, especially a nonmetrosexual male. “Gross!” I said, wondering how in the world Gavin hadn’t picked up on Weston’s peculiar lifestyle. I mean, it’s great that Weston is responsible enough to take care of eight pets and play the occasional out-of-town show. But he’s definitely headed toward wacko zookeeper territory, not exactly an aphrodisiac. “Yeah, Nacho, is another one of his dogs,” she said matter of-factly. “Bottom line: I can’t deal with that many pets.” “So did the night get any better?” I asked sympathetically. I mean, how much worse could it get? “A little. But only because I told him I needed to head home and feed my fish,” Jane added with her trademark cackle. For the record: Jane’s laugh is an interesting cross between Chandler’s ex, Janice, from Friends and Cameron Diaz’s California girl giggle that can be heard in any number of her movies. It’s loud and distinct, but somehow Jane manages to make it endearing. And that’s the funny thing about matchmaking. No matter how terrible a job I’ve done in the past, my friends (and even a few of my clients) just keep coming back for more. It’s practically my second job, even though my success rate is highly suspect, probably in the neighborhood of, oh, one for forty. It’s a good thing I’m not matchmaking on commission or I’d be poor — really poor. Just when I thought I’d be taking an extended break from setting up my girlfriends with their most recent Mr. Wrong, one of them would quickly remind me of my greatest success as Cupid: the day I introduced my friend Rain to Stinky Nate, who is now her husband. At first blush, it probably seems a little rude to call someone, let alone a friend, Stinky Nate. But Nate, a barista at my favorite downtown Minneapolis coffee shop, Moose & Sadie’s, is stinky and couldn’t care less. Much like Matthew McConaughey, he prefers the au naturel approach to personal hygiene. Basically, Nate’s the guy who’d make any environmental activist’s attempts to go green seem paltry in comparison. Nate showers only on special occasions (thank goodness he did on his wedding day, one of his few nonstinky moments) and doesn’t wear cologne — or even deodorant for that matter. Inspired by the way cats, his calico in particular, clean up by licking themselves, he’s been in constant pursuit of a more feline-like way to keep himself fresh. He hasn’t succeeded, though, which makes him smell less than desirable. Especially in the sweat-soaked summer months, which were rapidly approaching. But I knew Rain, a strict vegetarian who sews her own smock tops and only wears jewelry woven from hemp, would find someone like Stinky Nate simply irresistible. Of course, Rain maintained she wasn’t looking for love. Whenever I’d suggest a setup, she’d remind me that she was a feminist who was more than happy to spend the majority of her free time in the company of her two favorite musicians, Billy Joel and Helen “I Am Woman” Reddy. She needed a man like a fish needs a bicycle, she said. So I did it the old-fashioned way: I slyly introduced them when Rain and I met at Moose & Sadie’s for breakfast before church one Sunday morning. I’m pretty sure it was love at first sight, even though I’m not naturally inclined to believe in that sort of thing. Nonetheless, Rain and Nate totally hit it off and went out two days later (so much for swearing off men, huh?). And from the first wheat germ smoothie, their chemistry was palpable. Nate proposed a couple of years later (with an engagement ring made from hemp, natch), even though Rain had vowed she’d never marry. Now that the stinky/hippie couple is married — and happily so — I’ll admit that I can’t help but feel pleased whenever I see them together. Same goes for my best friend, Kristin, and her current beau, Justin. Even though I went out with Justin first (and trust me, it’s far less complicated in hindsight than it sounds), I encouraged Kristin to be patient with Justin when he was having trouble making up his mind early on, and it’s paid off big-time. They’re not only sublimely happy, but they’re talking about getting engaged soon. Thinking about Kristin getting engaged makes me think of how much I miss her. Ever since she accepted a teaching job in Duluth, which is a little more than two hours away, I hardly ever see her, save for the occasional weekend visit. Despite my successes and the ever-growing number of singles in my social circle, it doesn’t necessarily mean I’m destined for the soul mate–finding business, no matter how many of my girlfriends try to convince me that it’s my gift. But in the name of love, I’ll always give it my best shot. "If I tell you I love you, can I keep you forever?" Christa has such a fantastic way of giving readers the 411 on real world dating with loads of humor. I don't think I've read a book where we get to hear most of the characters in their own voice. I loved it. I'm always wondering what's going on in the other person's mind while I'm reading the main character think, talk, act, react, etc. This time we get to hear a boyfriend's point of view, a sister's dating life and her thoughts, friends, coworkers and the like. All their POVs are in 1st person! I also loved the exactness of Christa's locations. Living about an hour outside of Mpls, I know a lot of the places she's talking about. I've always wondered if authors use real places in their book. In Christa's case, she certainly did. Now, I'm not a city dweller and don't know about some of the restaurants, but most of the places are familiar to me. I never dated the way the characters in this book date, and I wonder what that would've been like. There's lots of eating, and that I would've missed. Not so much the heartache. At the beginning of each chapter, Christa quotes a line from a movie, most of them romantic ones. I think I laughed the hardest at the one from The Princess Bride. I'd say 90% of the other ones were movies I'd seen. The ones I hadn't seen were older. I can't remember off the top of my head if she quoted Say Anything in this book or her first one Around the World in 80 Dates. That is one of my all time favorite movies. Didn't every girl walk away from that movie in love with John Cusack? I love Gavin and Sydney's relationship. Gavin listens to Sydney's antics, her thoughts and her emotions, and always has something encouraging or positive to say to her. On the flip side, Sydney makes sure to talk to Gavin about his day and basically to check in with him. While Sydney is gone to NY at one point in the story, he realizes that life isn't going the way he thought, but in a positive way. As a wife, Sydney listens to him and supports him. They are a fantastic married example, even though they are fictional. Throughout this book, Sydney ends up getting involved in numerous dating relationships, other people's since obviously she's married. Funny thing is, most of the these people have sought her out for her advice. She hasn't just given advice where it wasn't requested. Silly as it may seem, I felt so bad for her sometimes. Several people got upset with her "meddling", but they were the ones who asked. Some great things I love about Sydney are her passion for Starbucks (a place my girls and I adore) She also loves fashion but is on a small budget. Too bad her old boss, Lucinda didn't understand that. And most of all, she wants everyone to find the same kind of love she and Gavin share. 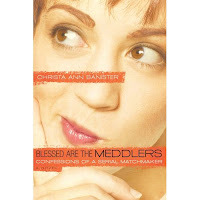 There are so many things I enjoyed about Blessed Are The Meddlers, it's hard to hit every single one of them. I know my teen girls are enjoying them as well. Brie just finished Around the World... and rushed out of her room for Blessed Are The Meddlers. So, it's definitely a hit in our house among the female persuasion. I'd give away this book, but I think my oldest would have my head on a platter. This one is a keeper. If you'd like to visit Christa's website, you can go to http://www.christaannbanister.com/ from there, you can find her blog, Facebook link, and a way to order this keeper of a book! They sounds great! I am going to see if my library has it!